When choosing a luxury hotel for your next holiday, it’s important to think about the amenities on offer. But don’t forget to take the views into consideration, too. At these six beautiful hotels in India, the surrounding vistas are reason enough to book a stay. From famous landmarks to ancient forts to the third tallest mountain in the world, come expecting some truly exceptional scenery. Located on the outskirts of gorgeous Darjeeling, the Glenburn Tea Estate doesn’t just look over the verdant slopes of the surrounding tea plantation. 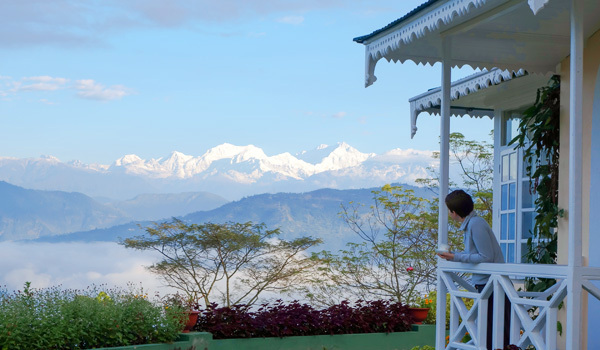 The hotel also offers views of Kanchenjunga, the world’s third tallest mountain. If you can rouse yourself early enough in the day, you’ll find that the mountain glows a beautiful rosy red during sunrise. And if you want to actually get up close and personal with the hilly scenery, the hotel also offers full-day hiking itineraries to the Glenburn Campsite, on the banks of the River Rungeet. It’s no surprise that a historic palace located in the centre of a shimmering lake ranks among the most beautiful hotels in India. The Taj Lake Palace has housed royalty and served as a film set, thanks to its stunning good looks; it’s also only accessible by boat, so you’ll be able to admire the surrounding views of Udaipur as you approach. 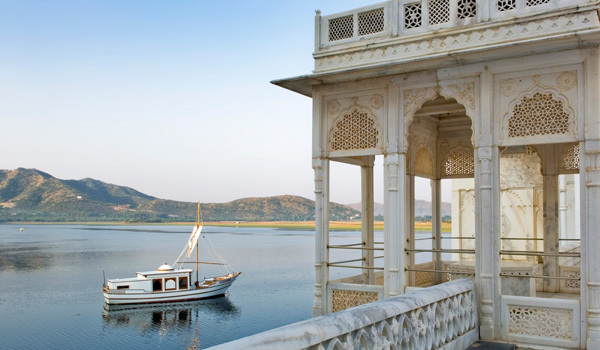 Once you’ve fully settled into the lavish surroundings, you can even dine in outdoor pavilions that look over the waters of Lake Pichola. 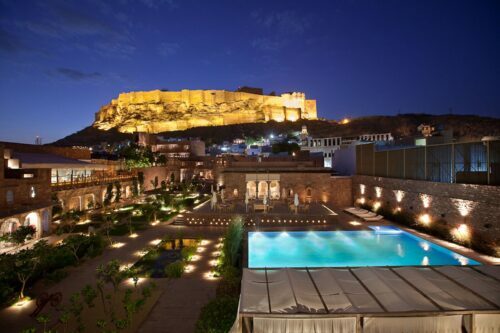 This view says it all: RAAS offers some of the most incredible vistas of the sweeping Mehrangarh Fort in Jodhpur. Partially housed itself in a renovated, 18th century haveli, the hotel mingles modern design with more traditional touches. 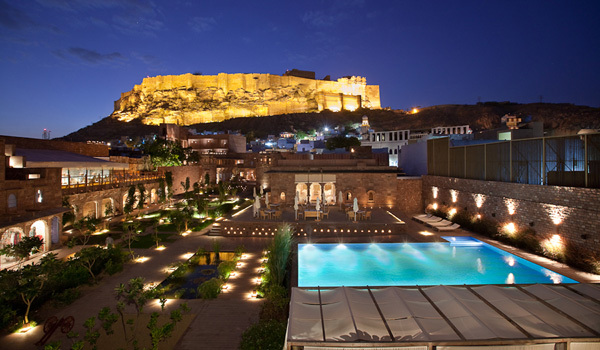 While virtually every room in the boutique stay looks out onto the fort, some of the best angles can be enjoyed from the terrace restaurant, Darikhana – convenient, given you’ll likely linger there for hours. 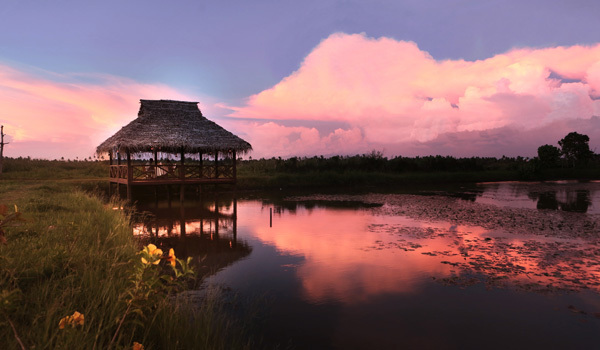 Kerala’s Coconut Lagoon prides itself on its tranquil, remote location. Surrounded only by old feudal villages, the hotel is perfectly located for those seeking to explore the rich habitats and gorgeous scenery of the region’s backwaters, including Lake Vembanad. Like the Taj Lake Palace, Coconut Lagoon is approached by ferry, so you’ll be given a water-bound tour of the region before you even check-in. Visitors can also take canoe trips of the local waterways, go on a sunset cruise – even hail chai wallahs, who, yes, also travel by boat. Mumbai’s Gateway of India ranks among India’s most iconic tourist attractions. Guests at the Taj Mahal Palace are in luck, then: the 5-star hotel directly faces the arch, meaning many visitors won’t even have to leave their rooms to grab a few great snaps. 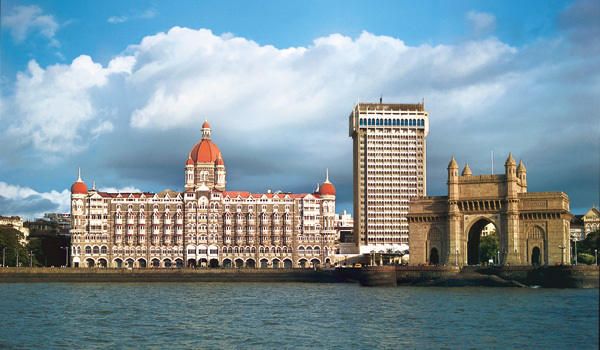 In fact, this hotel is itself an attraction – built 21 years before the Gateway of India was constructed, it has the distinction of being the city’s first harbour landmark. 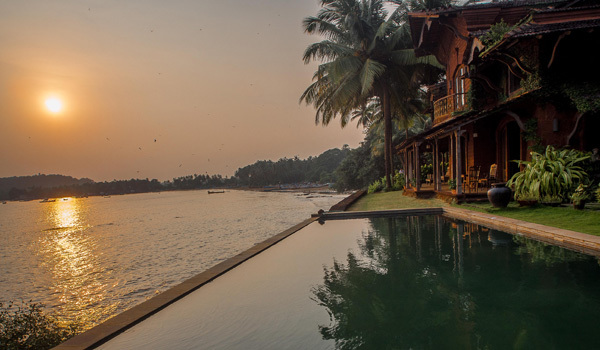 Overlooking the quiet inlet of Coco Beach on the Goan coast, the newly opened Ahilya by the Sea is already being hailed as one of the most beautiful hotels in India. This is a boutique stay that promises privacy and a return to the calmer, quainter Goa of the past. Some of the best views can be enjoyed in the seaside pool, where visitors can idle away the hours watching fishermen head out to sea.